ALSO Course Celebrates 25 Years! On August 10, 2016, UW Department of Family Medicine and Community Health (DFMCH) faculty and friends came together for a presentation and reception to celebrate the 25th anniversary of Advanced Life Support in Obstetrics (ALSO®), a course originally developed by the DFMCH’s James Damos, MD, and John Beasley, MD. The celebration was held at Madison’s Concourse Hotel during the national Family-Centered Maternity Care (FCMC) conference sponsored by the American Academy of Family Physicians (AAFP). 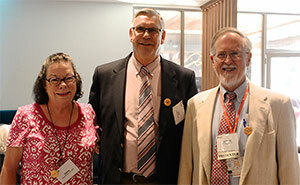 During the event, Stephen Ratcliffe, MD, MSPH, a faculty member at Penn Medicine’s Lancaster General Health family medicine residency program, was celebrated for serving as FCMC conference chair from 2008-2016. The DFMCH’s Lee Dresang, MD, will serve as FCMC chair starting in 2017. The sold-out FCMC conference attracted 320 maternity care providers from around the country, many of whom are family physicians. Dr. Dresang, along with the University of New Mexico’s Larry Leeman, MD, MPH, presented “Advanced Life Support in Obstetrics (ALSO): A Remarkable 25-Year Journey,” in which they shared the history and international expansion of the ALSO program over the past quarter century. Rounding out their presentation was a video with clips from early ALSO authors, including Steven Eisinger, MD, as well as international ALSO leaders. In 1991, Dr. Damos and Dr. Beasley developed the ALSO course to teach maternity health care providers—family physicians, obstetricians, midwives, emergency medicine physicians and nurses—ways to better manage obstetric emergencies. In 1993, AAFP purchased the course; it has since been taken by over 160,000 maternity care providers in over 60 countries around the world. The two-day course uses manikins for hands-on learning, focuses on teamwork and communication skills, and teaches mnemonics so providers can better remember management strategies during emergencies. Dr. Dresang, who is on the ALSO editorial board, said the one-third of the course curriculum is updated each year in response to new evidence. The ALSO program specifically helps providers in rural and underserved areas who may have lower-volume, but higher-acuity, practices. In 2015, DFMCH faculty published a paper in the International Journal of Gynecology and Obstetrics showing the positive outcomes of ALSO training in four low-resource countries. They found that ALSO training helped decrease overall maternal mortality, decrease postpartum hemorrhage and related maternal mortality, decrease episiotomy rates and increase caregiver comfort in managing obstetrical emergencies.